b. ^ Ulster contains all of the Northern Ireland constituency (3 MEPs) as well as part of the Midlands–North-West constituency (4 MEPs); the counties of Cavan, Monaghan and Donegal contain 17.5% of the population of this constituency. Ulster (/ˈʌlstər/; Irish: Ulaidh pronounced [ˈul̪ˠəi] or Cúige Uladh pronounced [ˈkuːɟə ˈul̪ˠə], Ulster Scots: Ulstèr or Ulster) is a province in the north of the island of Ireland. It is made up of nine counties, six of which are in Northern Ireland (a part of the United Kingdom) and three of which are in the Republic of Ireland. It is the second largest (after Munster) and second most populous (after Leinster) of Ireland's four provinces, with Belfast being its biggest city. Unlike the other provinces, Ulster has a high percentage of Protestants, making up almost half of its population. English is the main language and Ulster English the main dialect. A minority also speak Irish, and there are Gaeltacht (Irish-speaking regions) in southern Londonderry, the Gaeltacht Quarter of Belfast and in Donegal, where 25% of the total Gaeltacht population of Ireland is located. Lough Neagh, in the east, is the largest lake in the British Isles, while Lough Erne in the west is one of its largest lake networks. The main mountain ranges are the Mournes, Sperrins, Croaghgorms and Derryveagh Mountains. Historically, Ulster lay at the heart of the Gaelic world made up of Gaelic Ireland, Scotland and the Isle of Man. According to tradition, in ancient Ireland it was one of the fifths (Irish: cúige) ruled by a rí ruirech, or "king of over-kings". It is named after the overkingdom of Ulaid, in the east of the province, which was in turn named after the Ulaid folk. The other overkingdoms in Ulster were Airgíalla and Ailech. After the Norman invasion of Ireland in the 12th century, eastern Ulster was conquered by the Anglo-Normans and became the Earldom of Ulster. By the late 14th century the Earldom had collapsed and the O'Neill dynasty had come to dominate most of Ulster, claiming the title King of Ulster. Ulster became the most thoroughly Gaelic and independent of Ireland's provinces. Its rulers resisted English encroachment but were defeated in the Nine Years' War (1594–1603). King James I then colonized Ulster with English-speaking Protestant settlers from Britain, in the Plantation of Ulster. This led to the founding of many of Ulster's towns. The inflow of Protestant settlers and migrants also led to bouts of sectarian violence with Catholics, notably during the 1641 rebellion and the Armagh disturbances. Along with the rest of Ireland, Ulster became part of the United Kingdom in 1801. In the early 20th century, moves towards Irish self-rule were opposed by many Ulster Protestants, sparking the Home Rule Crisis. This, and the subsequent Irish War of Independence, led to the partition of Ireland. Six Ulster counties became Northern Ireland, a self-governing territory within the United Kingdom, while the rest of Ireland became the Irish Free State, now the Republic of Ireland. Ulster has no official function for local government purposes in either country. However, for the purposes of ISO 3166-2, Ulster is used to refer to the three counties of Cavan, Donegal and Monaghan only, which are given country sub-division code "IE-U". The name is also used by various organisations such as cultural and sporting bodies. Ulaidh has historically been anglicised as Ulagh or Ullagh and Latinised as Ulidia or Ultonia. The latter two have yielded the terms Ulidian and Ultonian. The Irish word for someone or something from Ulster is Ultach, and this can be found in the surnames MacNulty, MacAnulty, and Nulty, which all derive from Mac an Ultaigh, meaning "son of the Ulsterman". Words that have been used in English are Ullish and Ulsterman/Ulsterwoman. Northern Ireland is often referred to as Ulster, despite including only six of Ulster's nine counties. This usage is most common amongst people in Northern Ireland who are unionist, although it is also used by the media throughout the United Kingdom. Most Irish nationalists object to the use of Ulster in this context. Ulster has a population of just over 2 million people and an area of 21,552 square kilometres (8,321 sq mi). About 62% of the area of Ulster is in the UK while the remaining 38% is in the Republic of Ireland. Ulster's biggest city, Belfast, has an urban population of over half a million inhabitants, making it the second-largest city on the island of Ireland and the 10th largest urban area in the UK. Six of Ulster's nine counties, Antrim, Armagh, Down, Fermanagh, Londonderry and Tyrone, including the former parliamentary boroughs of Belfast and Londonderry, form Northern Ireland which remained part of the United Kingdom after the partition of Ireland in 1921. 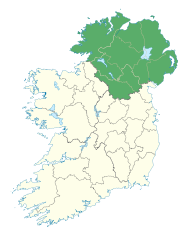 Three Ulster counties – Cavan, Donegal and Monaghan – form part of the Republic of Ireland. About half of Ulster's population lives in counties Antrim and Down. Across the nine counties, according to the aggregate UK 2011 Census for Northern Ireland, and the ROI 2011 Census for counties Cavan, Donegal and Monaghan, there is a Roman Catholic majority over Protestant of 50.8% to 42.7%. Only five Irish counties, all in Southern and Western Ulster, currently have no mainline railway. The historic Great Northern Railway of Ireland connected them. They are Cavan, Monaghan, Fermanagh, Tyrone and Donegal. A plan to re-link Sligo and Derry through Donegal has been postponed until at least 2030. Most people in Ulster speak English. English is taught in all schools in the province; Irish (Gaeilge) is taught in all schools in the counties that are part of the Republic, and in schools in Northern Ireland, almost exclusively in the Roman Catholic and Irish-medium sectors. In responses to the 2001 census in Northern Ireland 10% of the population had "some knowledge of Irish" and 4.7% could "speak, read, write and understand" Irish. Large parts of County Donegal are Gaeltacht areas where Irish is the first language and some people in west Belfast also speak Irish, especially in the "Gaeltacht Quarter". The dialect of Irish most commonly spoken in Ulster (especially throughout Northern Ireland and County Donegal) is Gaeilge Thír Chonaill or Donegal Irish, also known as Gaeilge Uladh or Ulster Irish. Donegal Irish has many similarities to Scottish Gaelic. Polish is the third most common language. 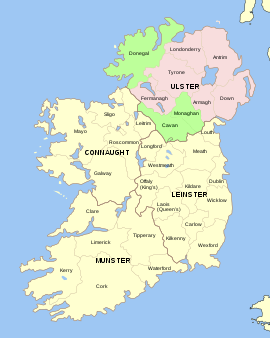 Ulster Scots dialects, sometimes known by the neologism Ullans, are also spoken in Counties Down, Antrim, Londonderry and Donegal. The province's early story extends further back than written records and survives mainly in legends such as the Ulster Cycle. The archaeology of Ulster, formerly called Ulandia, gives examples of "ritual enclosures", such as the "Giant's Ring" near Belfast, which is an earth bank about 590 feet (180 m) in diameter and 15 feet (4.5 m) high, in the centre of which there is a dolmen. The Plantation of Ulster (Irish: Plandáil Uladh) was the organised colonisation (or plantation) of Ulster by people from Great Britain (especially Presbyterians from Scotland). Private plantation by wealthy landowners began in 1606, while the official plantation controlled by King James I of England (who was also King James VI of Scots) began in 1609. All land owned by Irish chieftains, the Ó Neills and Ó Donnells (along with those of their supporters), who fought against the English Crown in the Nine Years War, were confiscated and used to settle the colonists. The Counties Tyrconnell, Tyrone, Fermanagh, Cavan, Coleraine and Armagh comprised the official Colony. However, most of the counties, including the most heavily colonised Counties Antrim and Down, were privately colonised. These counties, though not officially designated as subject to Plantation, had suffered violent depopulation during the previous wars and proved attractive to Private Colonialists from nearby Britain. The efforts to attract colonists from England and Scotland to the Ulster Plantation were considerably affected by the existence of British colonies in the Americas, which served as a more attractive destination for many potential emigrants. A barbarous country must be first broken by a war before it will be capable of good government; and when it is fully subdued and conquered, if it be not well planted and governed after the conquest, it will eftsoons return to the former barbarism. In the 19th century, Ulster had the only large-scale industrialisation and became the most prosperous province on the island. In the latter part of the century, Belfast briefly overtook Dublin as the island's largest city. Belfast became famous in this period for its huge dockyards and shipbuilding — and notably for the construction of the RMS Titanic. Sectarian divisions in Ulster became hardened into the political categories of unionist (supporters of the Union with Britain; mostly, but not exclusively, Protestant) and nationalist (advocates of repeal of the 1800 Act of Union, usually, though not exclusively, Roman Catholic). Northern Ireland's current politics originate from these late 19th century disputes over Home Rule that would have devolved some powers of government to Ireland, and which Ulster Protestants usually opposed—fearing for their religious rights calling it "Rome Rule" in an autonomous Roman Catholic-dominated Ireland and also not trusting politicians from the agrarian south and west to support the more industrial economy of Ulster. This lack of trust, however, was largely unfounded as during the 19th and early 20th century important industries in the southern most region of Cork included brewing, distilling, wool and like Belfast, shipbuilding. In the aftermath of World War I, the political party Sinn Féin ("Ourselves") won the majority of votes in the Irish general election, 1918, this political party pursued a policy of complete independent self-determination for the island of Ireland as outlined in the Sinn Féin campaign Manifesto of 1918, a great deal more than the devolved government/Home Rule advocated by the (I.P.P)Irish Parliamentary Party. Following the Sinn Féin victory in these elections the Irish Declaration of Independence was penned and Irish republicans launched a guerrilla campaign against British rule in what became the Irish War of Independence (January 1919 – July 1921). The fighting in Ulster during the Irish War of Independence generally took the form of street battles between Protestants and Roman Catholics in the city of Belfast. Estimates suggest that about 600 civilians died in this communal violence, the majority of them (58%) Roman Catholics. The IRA remained relatively quiescent in Ulster, with the exception of the south Armagh area, where Frank Aiken led it. A lot of IRA activity also took place at this time in County Donegal and the City of Derry, where one of the main Republican leaders was Peadar O'Donnell. Hugh O'Doherty, a Sinn Féin politician, was elected mayor of Derry at this time. In the First Dáil, which was elected in late 1918, Prof. Eoin Mac Néill served as the Sinn Féin T.D. for Londonderry City. Partition of Ireland, first mooted in 1912, was introduced with the enactment of the Government of Ireland Act 1920, which gave a form of "Home rule" self-government to two areas, Southern Ireland, with its capital at Dublin, and "Northern Ireland", consisting of six of Ulster's central and eastern counties, both within a continuing United Kingdom of Great Britain and Ireland. Dissatisfaction with this led to the Irish War of Independence, which formally ceased on 11 July 1921. Low-level violence, however, continued in Ulster, causing Michael Collins in the south to order a boycott of Northern products in protest at attacks on the Nationalist community there. The Partition was effectively confirmed by the Anglo-Irish Treaty of 6 December 1921. One of the primary stipulations of the treaty was the transformation of Ireland into a self-governing British dominion called the Irish Free State (which later became the sovereign Republic of Ireland), but with the option of a continuation of the home rule institution of Northern Ireland, still within the United Kingdom, if the Northern Ireland Parliament (already in existence) chose to opt out of the Irish Free State. All parties knew that this was certain to be the choice of the Ulster Unionists who had a majority in the parliament, and immediately on the creation of the Free State they resolved to leave it. Electorally, voting in the six Northern Ireland counties of Ulster tends to follow religious or sectarian lines; noticeable religious demarcation does not exist in the South Ulster counties of Cavan and Monaghan in the Republic of Ireland. County Donegal is largely a Roman Catholic county, but with a large Protestant minority. Generally, Protestants in Donegal vote for the political party Fine Gael ("Family of the Irish"). However, religious sectarianism in politics has largely disappeared from the rest of the Republic of Ireland. This was illustrated when Erskine H. Childers, a Church of Ireland member and Teachta Dála (TD, a member of the lower house of the National Parliament) who had represented Monaghan, won election as President after having served as a long-term minister under Fianna Fáil Taoisigh Éamon de Valera, Seán Lemass and Jack Lynch. As of 2017[update], Northern Ireland has seven Roman Catholic members of parliament, all members of Sinn Féin (of a total of 18 from the whole of Northern Ireland) in the British House of Commons at Westminster; and the other three counties have one Protestant T.D. of the ten it has elected to Dáil Éireann, the Lower House of the Oireachtas, the parliament of the Republic of Ireland. 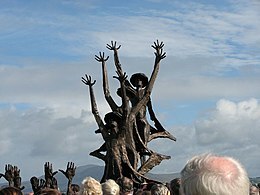 At present (August 2007) County Donegal sends six T.D. 's to Dáil Éireann. The county is divided into two constituencies: Donegal North-East and Donegal South-West, each with three T.D.'s. County Cavan and County Monaghan form the one constituency called Cavan-Monaghan, which sends five T.D. 's to the Dáil (one of whom is a Protestant). William Sherard (1659-1728) was the first biologist in Ulster. In Rugby union, the professional rugby team representing the province and the IRFU Ulster Branch, Ulster Rugby, compete in the Pro14 along with teams from Wales, Scotland, Italy, South Africa and the other Irish Provinces (Leinster, Munster and Connacht). They also compete in Europe's main club rugby tournament, the European Rugby Champions Cup, which they won (as the Heineken Cup) back in 1999. Notable Ulster rugby players include Willy John McBride, Jack Kyle and Mike Gibson. The former is the most capped British and Irish Lion of all time, having completed four tours with the Lions in the sixties and seventies. At international level players from Ulster join with those from the other 3 provinces to form the Irish national team. They do not sing the Irish national anthem but do sing a special song which has been written celebrating the "4 proud provinces" before matches start. Cricket is also played in Ulster, especially in Northern Ireland and East Donegal. Ulster enters two teams into the Interprovincial Series; the North Knights and the North West Warriors, who are the respective representative teams of the Northern Cricket Union (NCU) and the North West Cricket Union (NWCU).